I'm working from notes, newsletters and memory. Corrections are welcome. Ray, Bren and Starkad did a demo in my Shakespeare class. David McPherson was the professor. Went to a meeting in the SUB at UNM. I remember Kristjan, Hieronymous, and Mirhaxa being there. She was working on a little tapestry. Years later I learned that was the organizational meeting of al-Barran. Mirhaxa notes that the organizational meetings were at Raymond's house, maybe in March. This might just have been the first public-at-UNM recruitment meeting, then. Went to Grand Outlandish with the McPhersons for one day. 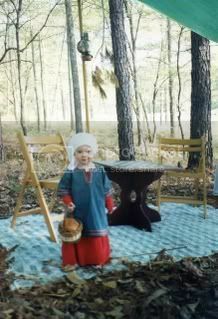 I remember sitting in the shade watching some of a tournament, and meeting the twin brothers of Hieronymous and watching them and Kate McPherson and some other younger kids who were in a six-sided tent more like a hogan with cloth sides than any medieval tent. They were the pages and handmaidens school and that structure, which I saw other times later, was their meeting place. Notes and accounts of my deeds and travels, gathered from various journals, letters and reports of the times when they were new. This was inspired by a request for me to tell about when I was Steward and later Executive Director. In looking for show'n'tell items and memory joggers, I realized it wasn't easy to put my hands on such things, and also that there were things that should be shown and told to more than just those people who were at the Wednesday discussions at my house that season. I came across a journal I had forgotten I kept in the 1970's. One year Gunwaldt and I went to Loch Salann (Salt Lake City, from Albuquerque) ten or twelve times. I hope to find the calendar on which we marked the events we attended that year. Only a couple or three weekends did we stay at home and not go to an event. There were times others substituted for me, when I went to England, and when I was royalty, and I want to document and credit them. Baldwin of Erebor, Leah Kasmira of Natterhelm and a few others for shorter stints. The inspiration to set it up and fill it in came from the Outlands History blog and my own mundane bio pages (links on the right there). As much as possible, this will be quotes written at the time things happened, rather than later memories. I intend to fill it in as papers and notes arise. Things with quotation marks are probably from my diary file, or other little notebooks I carried around from time to time over the years. Without quotation marks, probably written retrospectively. October 26, Outlands second coronet tourney. Mad James of Duckford carried my favor. 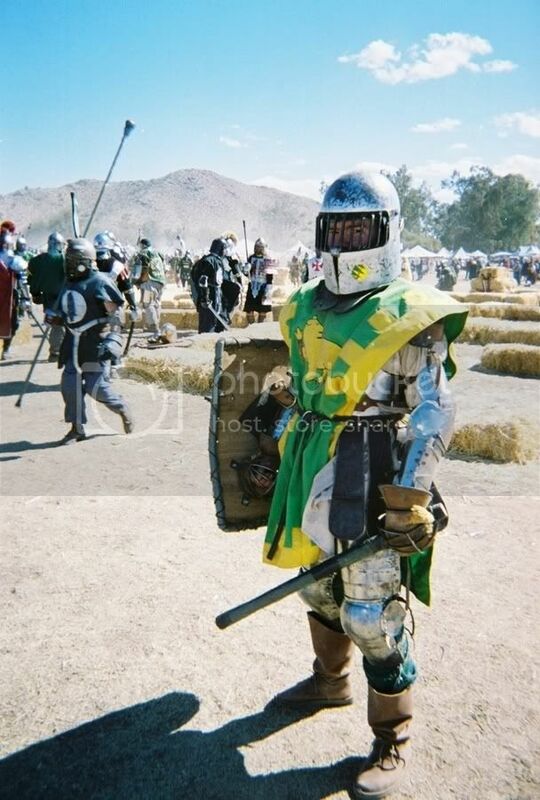 He defeated two knights, Sir Bren and Sir Theo. Theo cried. James decided he didn't like SCA combat anymore, if some people were going to take it that personally. Turned out, longterm, Theo cried easily (and sometimes theatrically, at sword oaths and fealty ceremonies), so it wasn't as bad as it seemed to James that day. We stayed with my Aunt Ophelia in CSpgs. 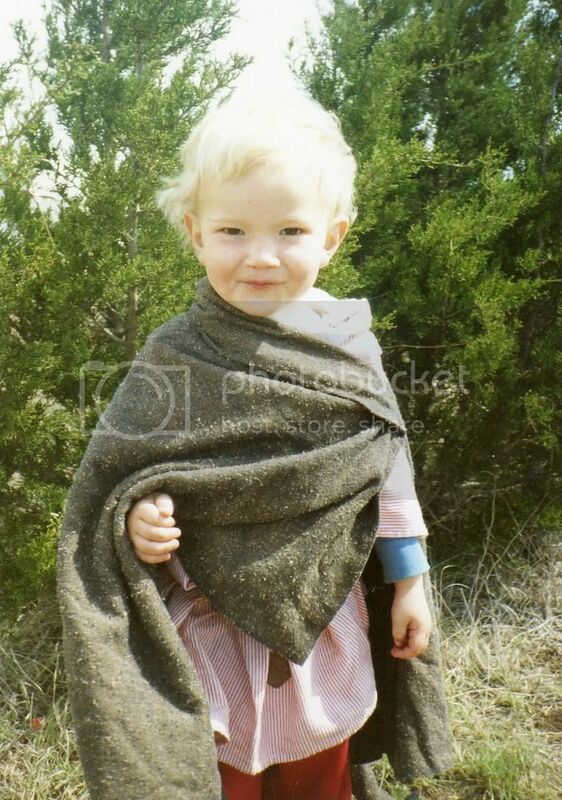 December 17, I was made Principality Seneschal at Midwinter. January 1, house full of people who stayed over. January 21 Matriarchy Revel in Dragonsspine. Gunwaldt and I drove up and met James/Jimbo. The three of us went together, then Jimbo went skiing with Will Patterson. Keith and I went back to Espanola. I had forgotten my costume (first and last time that happened), so Anne Gaverel d'Avesor and Kathleen helped me make an underdress, and Anne loaned and then gave me a blue overdress she had made as a test/pattern for something she did in brocade. I wore the plain one, and that was great. Took our "Holy Grail School" bus to the first Burro Creek War. At that event we met Peter and Alexander, and had a great time. Mark and Hieronymus did an Easter mass (it was a communion service, because neither could do mass at the time, but they had consecrated hosts), and there was live period music people had learned the day before in a workshop. We had a procession to the theater in the English department building which was new at the time. The rest of the event was upstairs in the Student Union Building, and some out in Yale Park where the UNM bookstore is now, but which used to be a long, ratty old city park between Redondo and Central. I remember vividly, in those days, how unaware I was that it wasn't normal for people to learn music in an hour-long session and perform it the next day. We lucked out MANY times, having very competent musicians around, and that was one of those lucky times. Saturday night, Gunwaldt and I performed Morley's "I Go Before My Darling," and did it better than we ever did it before or after. There were many Ansteorrans up for this event (they were still Atenveldt then), and lots from Loch Salann. Mistress Irminsul was Kingdom Mistress of Arts, and Master Gwylim the Smith, of Bryn Gwlad, was Master of Sciences. Theo won. It was at Beth Aeby's family's land on the Rio Grande in La Mesilla (near Espanola, not the one near Las Cruces). There is a wonderful chronicler from the point of view of Loch Salann here (and it's fun for me because my name appears several times, my having been the fourth member of Hastle Castle) (www.sff.net/people/kitsune/sca/outlandishv.htm), and another linked there. Hastle Castle consisted of Ferelith, Rhonwen and Jerilyn, and I was made a member, but I stayed way in the background and rarely mentioned it because the three of them were so dynamic and central to their shire-to-be-barony. Gunwaldt and I saw Peter and Alexander driving into the site, ran and met their vehicle and told them right then through the windows which was which. We had studied to know the difference. "Right," they said, "only now I'm Sigmund and he's AElfgar." So we were very confused for a while. 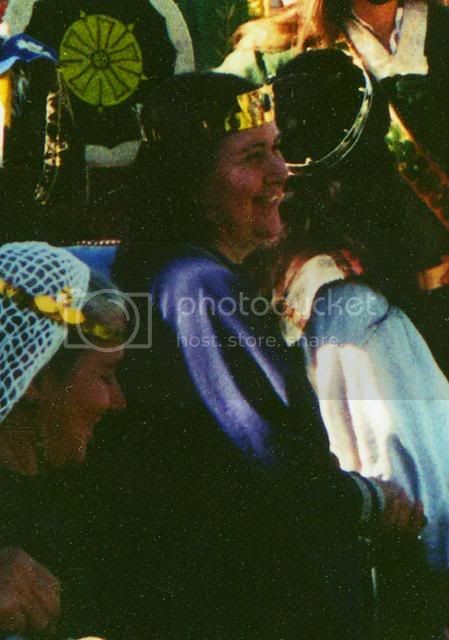 Malinda von Hohen Staffen was queen, and asked if I would be kingdom seneschal. I declined because I was having fun being principality seneschal. I reconsidered in June when I was told they were considering putting someone else in that I thought wouldn't be good in the job. It wouldn't have been as fun being principality seneschal without a good superior officer. So I agreed to do it. I held that office for four years, with breaks to go to England for a month and to be princess for six months. Weekend after Outlandish, Van Dag hosted the "We're All Too Tired" revel (Gunwaldt organized it, I think), at the meadow near Sandia Man Cave. People helped each other cross the stream; there's no bridge. Ferelith took over as Principality Seneschal and I became Seneschal of Atenveldt. The Loch Salann crowd stayed at Gunwaldt's (where I was staying for the summer, though I still lived in Shadowskeep during the school year until summer 1979), and we took the Holy Grail bus to Lonely Mountain. Rhonwen's account. We were at Santa Clara Canyon (near Shadowskeep / up the road from Puye Cliffs). Lots of people came from Atenveldt (barony of). Gunwaldt won, I got to be Snow White. Rhonwen's chronicle is here. I became Kingdom Seneschal there (with a prop scroll as a humorous prop, because the real one wasn't back from the steward yet). 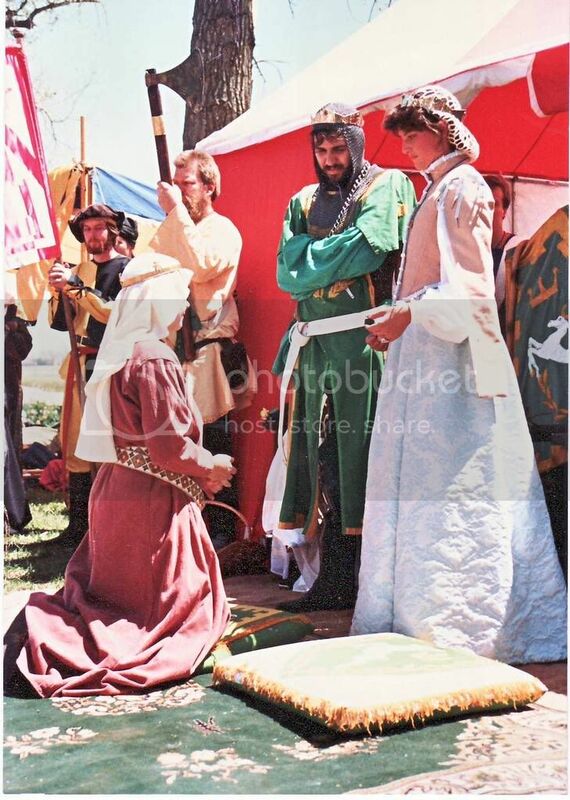 I was given a Grant of Arms, so I got to be "Your Ladyship" for a while, though I always thought everyone with an AoA should've had that form of address. "Lady AElflaed" was the prettiest any title ever sounded with my name. This is probably my identifying rank and award. When people say "Mistress �lfl�d " I think it's the Pelican they're thinking most often. This isn't my favorite honor; being a Walker of the Way is. Premier Russian Thistle is pretty wonderful. But the Pelican is something I've always been absolutely confident in. I never doubted I had earned it or could earn it again, so maybe it's my most comfortable, like a favorite pair of shoes or a beloved chair. And when I think of my duty, it's the Pelican duty I think of first. That was a very cold day, and there was a long belted circle in the men's room (cinderblock bathrooms at the campground). Gunwaldt wasn't allowed in at first, and Heinrich seemed confident or hoping that Gunwaldt was in trouble. Koris often kept Gunwaldt from entering Crown for one reason or another. But this time it was so Koris could use Gunwaldt's honor and service to shame the knights for their own slackitude of the season. Heinrich won the tournament with a spear. Got married in March. I was Steward, Gunwaldt was seneschal of al-Barran. I was Steward until July. Broke my leg in July; unrelated incidents, but I missed the last board meeting I would've attended. Lavan was knighted. This was the first time the black and gold pavilion was used for a vigil. I don't have photos of the vigil, but there are knighting photos. The Outlands became a kingdom on June 14, 1996. Many al-Barranians flew to Caerthe. There were discount flights, one of the only times ever. The Sunport still had the little departure gates through the tunnel, in the midst of the runways. Almost everyone in there was al-Barranian. We were on three flights, on two airlines. I was eight months pregnant, but as it was only a one-hour flight, I had a note from the doctor saying to let me go. 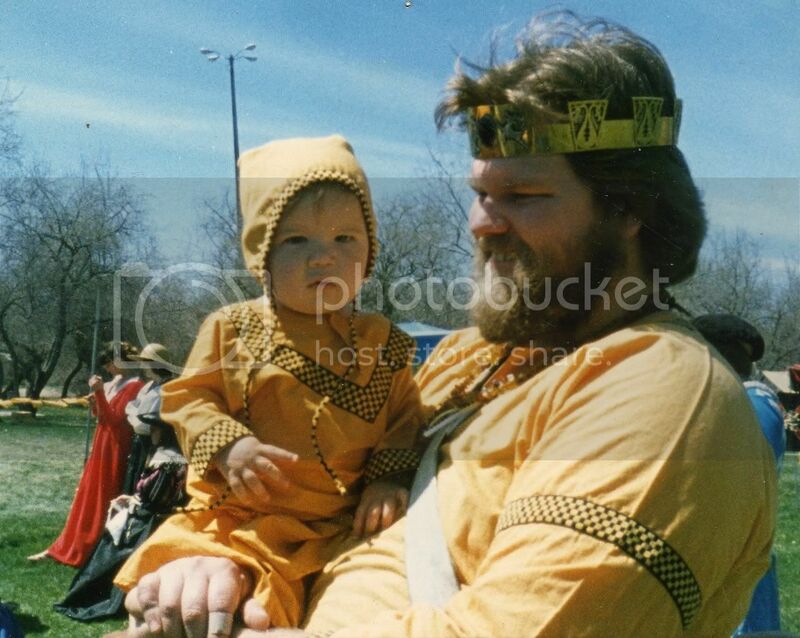 Magnus (Kirby) was born July 29, while Gunwaldt and I were king and Queen. Gunwaldt went. I stayed home with Kirby. Artan was knighted. I sent a scroll to have read, to speak for him as a Laurel. Artan made Lavan a bearer of the Cordon Royal, and I did the scroll. I found and transcribed (in 2008) my 1987 pre-scroll notes here and will add an image when I find the three-part photocopy. Artan II and Tara made me a Walker of the Way. I don't remember who took the photo, but am willing to credit it if anyone knows. Click to enlarge. At the left are Lord William de Vallier (Artan's squire) and Master Gunwaldt (holding the axe). May 6, 1990 4:00 I was at a Musica Antigua de Albuquerque concert, with Rodema. It was Musicke for Mary and Elizabeth, and was at the United Methodist Church at 1615 Copper. 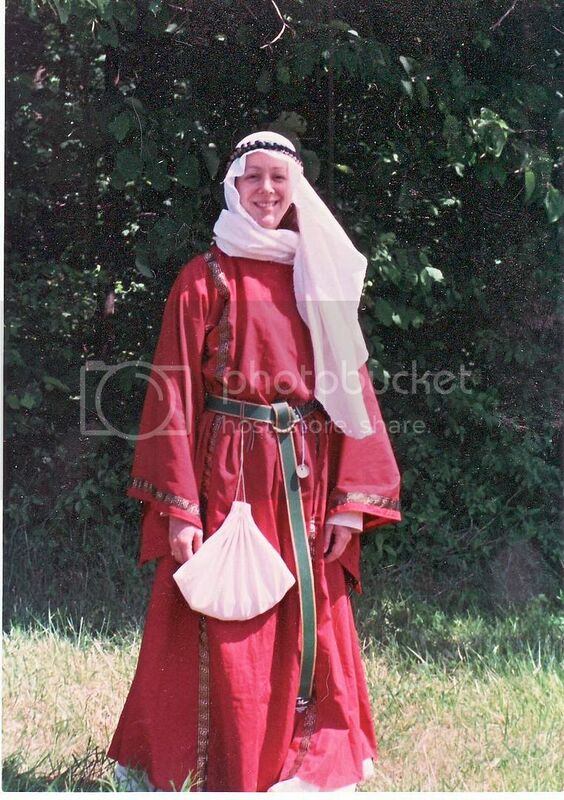 Mistress Rodema wasn't active in the SCA much anymore. In college, I played in an early music group with those who later formed Musica Antigua. It was called "The Keller Consort" when we were all still students, 1972, 1973.... It was John Truitt, Allison Edwards, Colleen, me and... (I'll find a program at some point and fill this in better.) 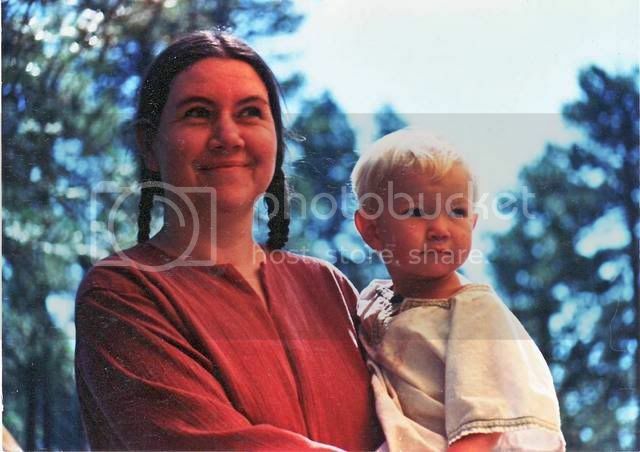 I went back to Espanola, and later joined the SCA. The others kept playing together. 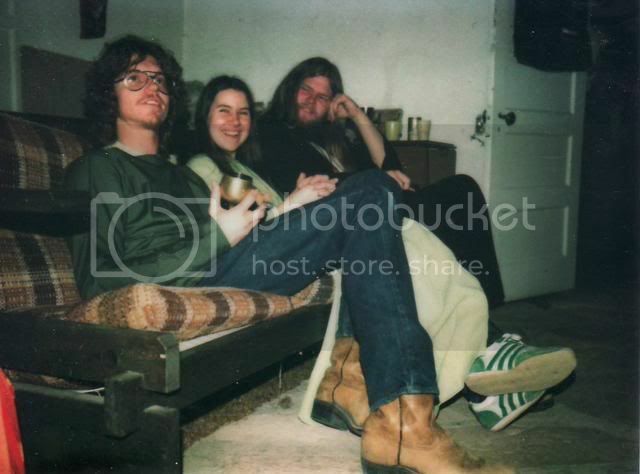 Colleen married Art Sheinberg and the two of them became the core of Musica Antigua. The last time I played with them was at Allison's wedding, July 3, 1977. It was those above (including Art), and Bob Shlaer. I dropped my maple soprano off the choir loft at the alumni chapel during the rehearsal. John went and got it for me (in case it was busted, but it wasn't). December, the music group performed at a nursing home. Estrella, Bardolf was two, Magnus was five. 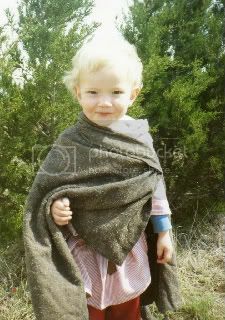 SCA Argent Anniversary, near Austin. Took the Wildebus and a trailer, a babysitter we picked up in Deming (I will find her name, at some point—she bought a cool sword with the money). I found out I was pregnant with Holly right after we got to the site. That's Bardolf, to the right. We camped with Kate Holford and they played with Zach for days and days. I taught four or five classes (and will clarify with I find evidence). Three ballads classes (beginning, intermediate and advanced), Chaucer?. 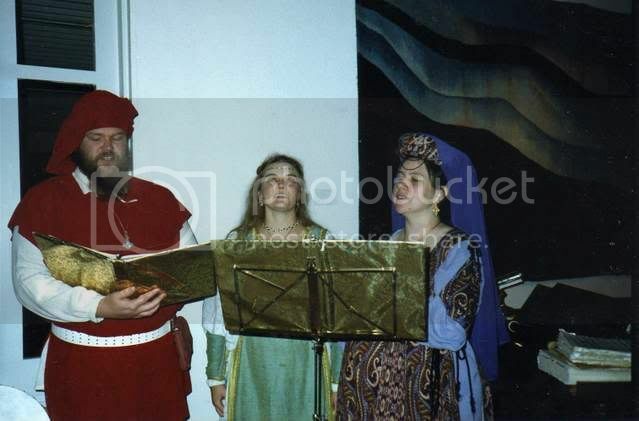 The most fun thing for me was singing with the madrigal group (everyone was the music leader of wherever they were from), and the instrumental music. Mistress Marie, of Trimaris, a recorder/krumhorn player, was great fun. I ran a bardic competition for The Outlands. Marie came and played the Black Adder theme on a krumhorn, without intro. Very fun. Mistress Sabia, of Stargate, who usually plays harp, sang a medieval Spanish piece of the Virgin Mary (and I'll find those notes someday and tell more, but I remember those two 18 years later). The Outland had an official handout I had written, with assistance and approval. It was on green paper, but the scanner scanned it cleaner: More info and the scan both are here. May 1991, the first issue of ThinkWell came out. 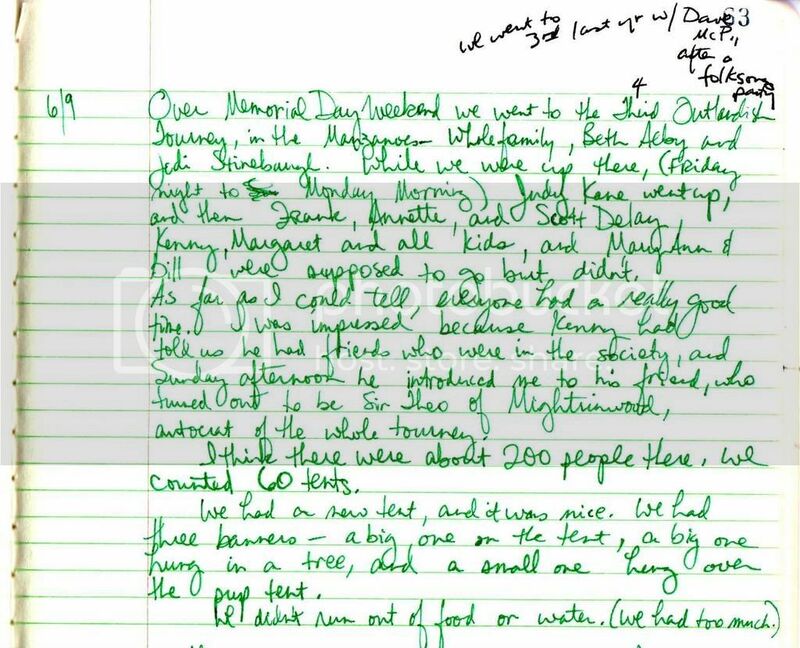 some of these 1992 notes in green are just sketchy, transcribed from a calendar Holly wants to cut up (Beatles album cover art). Some might not turn out to be events, or might be things I didn't go to but had noted to avoid conflict, but I'll add notes as I find confirmations. Love Revel, al-Barran. Asta won the costume contest. April 18-27, Gyrth, Melisande and Michael were at Disney World. It didn't affect me, but it was on my calendar and someone might want to know at some point. April 25, Ray's mom's party (I don't remember why there was a party at Raymond's mom's, but I went. 18, Caerthen Warlord is written on my calendar, but then "Civic Plaza" and it was circled, so I think we went to Downtown Saturday Night for a demo, maybe. August 4 (Wednesday), "Jeff 2:00"
I think this is the year it was at Heinrich Rader's house. I used the ideal officers and ideal royalty handouts from Bright Ideas, if so. If this was at Koris's, move that note to the other year, when/if it gets more straightened out. The night at Heinrich's house on north Edith (past Alameda) was crowded, well-attended, Cathyn was there; lots of people were there. December 12 says "9-4 RenFaire, Midwinter, Saturday Paul gets Jeff"
final note on December: On the 11th at night a three-tier snowman fell after twenty days. I know which snowman. April, Asta and I flew to Fool's War in Meridies, for a ThinkWell discussion. "That Outlandish, 1993, Gunwaldt autocrated AND came down with Hepatitis." "Fall Crown, Gunwaldt came in second to Cyredd (again)." At some point this fall I started talking with Dwynwen, in the Midrealm, about the possibility of her being a long-distance student. She was in a small shire in Illinois, and was frustrated about knowing more than others in her group. She found me in a homeschooling discussion. In December, she and her family came to visit. Rodema did a calligraphy workshop for her, and others. This was a very eventful year. Early in the year my children were 7, 5 and 2. Artan and Aziza were King and Queen in summer. Gunwaldt autocrated Outlandish. I was asked to be ED in June, keeping Lilies from being cancelled, and three kingdoms from incorporating separately. William de Vallier died. 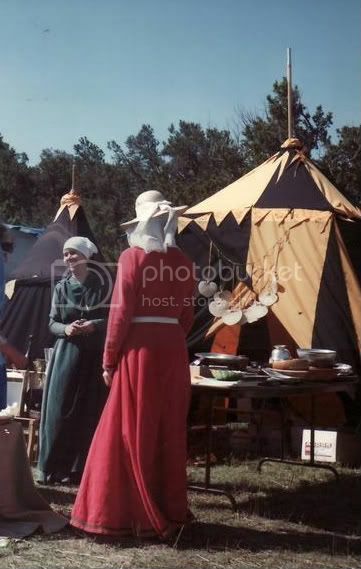 I went to Pennsic, stayed at Mistress Alys Katharine's house in Cleveland afterwards (and Artan and Blaise). "Estrella, I didn�t go. Took an apprentice the week before (Thora)"
Gunwaldt autocrated Outlandish. My student Dwynwen (who later changed her name to Anne Marie) came out with her family. They had moved to Michigan, or were about to. "Outlandish, Gunwaldt autocratted, but Honeywell had a deadline, and Needham and Susan and Artan ended up splitting out a lot of it. (Took an apprentice: Laurel, right after she had gotten a Russian Thistle AND award of arms.)" June 9, was made Executive Director of the SCA, after 24 hours to think about it. NOTES ON EXECUTIVE DIRECTORSHIP, JUNE 1994 on. June 7 A.J. called and said he was thinking of quitting. June 8 asked me to consider taking Tony�s place for four months. June 9, conference call and they voted me in. Randall to me about the membership rate date change Renee and I made over the June 11/12 weekend (conversation Monday June 13, I believe). on June 4, we were having a philosophy discussion, 25 or 30 people at Sir Vagn's house (Vagn is Gunwaldt's most recently knighted squire). It was going better than I had dreamed it could, and for the second of two rounds of introduction, at about 10:30, I asked for people to name a person who had been a mentor to them when they were new in the Society, and whose teachings they had passed on to others. I didn't start it, Gunwaldt did. He named three people, which wasn't my original plan, but it turned out better. As it went around, people named two, maybe as many as six. The testimonials were really touching, and some people cried. I had intended to credit Lady Simonetta who helped me found the group in Espanola, to point out that she had never become a peer but she had taught me things I still pass on, and I still hear her voice sometimes and see her face when I'm thinking through things or repeating her words to people. I ended up talking about her and about Baldwin. Koris was after me. He named a couple of early Aten guys I never knew, and he named _ME_ and Baldwin. He named you, which didn't surprise me any. I was surprised and flattered that Koris felt I was one of his teachers (and had passed my stuff on) and that he would admit it in a large group. 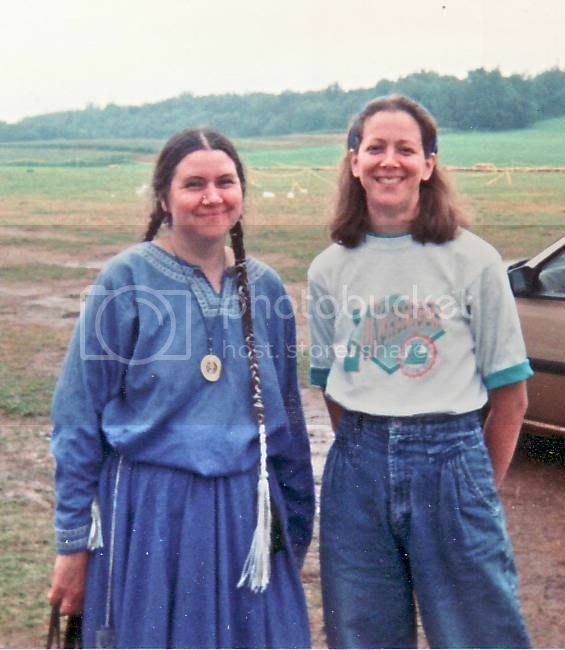 Some of us played music for Kathy Hoag's wedding to Pete Domenici Jr.
Pennsic, Artan's birthday (and he was king), I hung out with AnneMarie/Dwynwen (I don't remember if she had changed her name before Pennsic; I don't think so). William Blackfox did art and gave it to me. It was shared at the board meeting after (or I sent copies to the people in there, or something; if I remember or find evidence, I'll change this). I resigned, not in the midst of the big meeting, but after the meeting in one of the very-many side-sessions. Got drunk that night (uncharacteristic for me). Lots of us did, and told stories and made each other laugh. It seemed right. Artan was made a Pelican with one day notice. We had a vigil in our camp, in the black and gold tent shown up above in 1985. Artan would have preferred not to have a vigil, having been a knight already for nine years. King Irel was treating me as Artan's mentor, though, and so I had a say, and I think what Pelicans hear is unlike what Laurels and Chivalry hear. Also in the photo: Duchess Leah Kasmira and Mistress Kate Holford. Do�a Ainrea (later Aindrea, later Matilda) became my student. 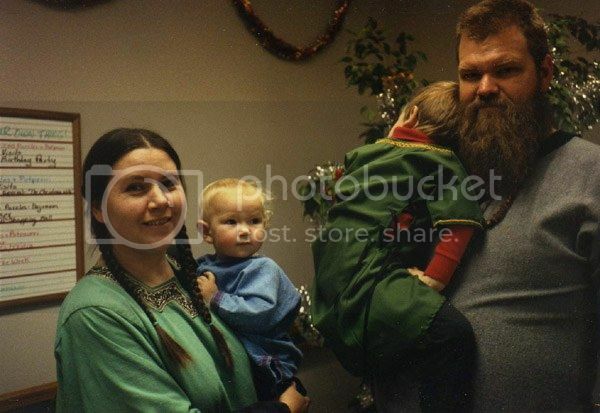 December 14, 1996, I was at a party at Lycurgus and Mina's house on KAFB. It was a late party; I went at 11:30. Early '98 I was still in burn-out. late January I wrote "endurance, perseverence" and then "compassion" on the inside of Martino's shield. March Crown, BIG bright day: Martino, Aindrea, Balthazar, Bohemond, some others. First magic day of several. 1998 Balthazar, AnneAliz became students. March 7, Wednesday, last of the philosophy discussions of the winter. 2) I want to tell you something about power and using people, humility that comes from power (I think I figured out that question I kept asking, weeks back), duty/responsibility and probity. 3) You'll need to come over tonight if you want to hear me tell you how wonderful these Wednesdays were and how the existence of these discussions brought AElflaed back to SCA-life (Martino said I'm in denial about being back, so I guess he's right and I'll admit to "back"), and how great you all are, because I'm not going to say it here. On the mailing list: Karl, Charles, Temuqui, Bardolf, Dermod, Balthazar, Odile, Artan, Tancred, Mordygan, Kendrick, Govanen, Gwydion, Chris (Tancred's co-worker, came once or twice), and Sadie. Fall T.I. had a short article from Bright Ideas, and an interview with me. It's here: http://sandradodd.com/duckford/ti2007 Kate Holford contacted me after that, but as far as I know she's the only person who ever saw it naturally. Nobody in my Wednesday discussion group gets T.I. anymore, and I had lapsed and missed that one. I got two copies and a t-shirt for my cooperation, though, and I'm glad it was there. People who don't know me might have benefited from the suggestions for helping newcomers. 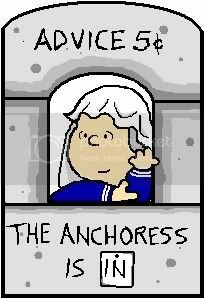 Anchoress days. 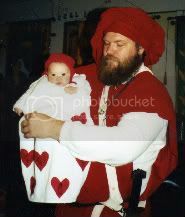 Lord Dermod Killarney is my student as well as being Artan's squire. Wednesday nights through April (since last fall) we've met at my house 6:30-9:00 for discussions and food. Primarily for the benefit of Artan's squires (Dermod and Bardolf), the meetings have included Artan and me, Mordygan, Balthazar, AnneAliz, Asta, sometimes Odile, Charles, Kendrick, and occasionally Gunwaldt. Beatrice would've been there but was working Wednesdays. We corresponded some. April 9, Wednesday Dermod had requested I tell them about when I was Steward and Executive director. The first was the early 1980's The second was the middle part of 1994. We gathered up just *some* of the things happening in 1994, part of which inspired me to start this file to gather such things. Well, there will be other Wednesdays, most likely, but this is the last of the winter session of A.S. whatever it is these days. I looked on a newsletter. XLII. Right. Thirty years since XII, when I joined. May 1 will be 31 years, for me, I think, though I rarely trust me with numbers. Artan has a request, a topic, which can be worked around food and games. I have a few clarifications and follow-up bits. I'm looking forward to seeing you all (all but Sadie and Charles, maybe) before I find other things to do on Wednesdays. Where do you see yourself, in the SCA, in five years or ten? Real respect has to do with trust and admiration. Can you make decisions toward being trustworthy and admirable? Regulars this season: Artan, Dermod, Bardolf, Balthazar, Mordygan, AnneAliz, Asta, Odile early in the season; Kendrick later. Sadie worked on Wednesdays. Charles was here a few times, but mostly out of town. TO BE FILED: There is a scan of the newspaper announcement of this somewhere. Elinor, Gunwaldt and I sang at Sadie's Restaurant on Central, for Christmas. It was the 1980's but I don't remember when. The announcement will say.